The YuLong River, YùLóng Hé, starts in YangShuo County near Litang and flows for over 35 kilometers (22 miles) to the Li River near the town of Ping Le; GuangXi province. The YuLong River is relatively shallow at around 5 meters (16 feet) maximum depth and is an average of 25 meters (82 feet) across. 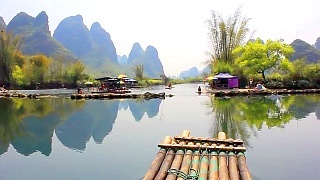 Unlike the deeper Li River, it has no motorized boat traffic and bamboo rafts, paddle boats and swimming are popular. The bamboo raft journey begins at the YuLong Bridge, which is 400 years old. Hiking and biking are also popular as there are many quaint villages along the river, some offering bed and breakfast accommodation. The YuLong River Valley is very fertile, and its low-lying terrain is excellent for rice fields. In recent years, farmers have also planted more cash crops such as pomelos, tangerines and mandarin oranges. 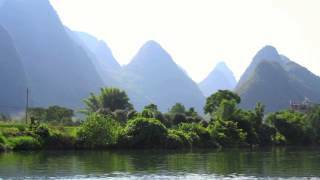 Between YangShuo and GuiLin, GuangXi province, south China.